Crossing Peru on a Tricycle Taxi Cab - The Most Difficult Bike Tour I've Ever Attempted? Today is day #1 of what is likely to be the most difficult bike tour I have ever attempted. Those of you who have been following along here at Bicycle Touring Pro will know that for the past couple months I’ve been traveling through the South American country of Peru. But what you may not have realized is that up until this point I have not had a bicycle with me. Instead, I’ve been getting around on buses, in taxi cabs, and on foot whenever possible. Yes, I did do a little cycling when I was in Lima, but other than that, this trip through Peru has been largely without bikes. Until now…! You see, the city of Puno, which is located on the western shore of Lake Titicaca in Southern Peru, is a city bustling with bicycles. Actually, tricycles lead the charge here… not bikes. There are tricycles made to haul goods from one side of town to another. There are tricycles set up with barbecues welded to their tops so that street vendors can easily roll their meats from one corner to the next. And more than anything else, there are tricycles designed to carry passengers (and their gear) wherever they wish to go within the city limits. The Peruvian tricycle taxi cab is unlike anything I’ve ever seen before. They’re usually highly decorated, totally beat up, and most of them lack gears or brakes of any kind. And after arriving in Puno, Peru just a few short weeks ago, it was these tricycle taxi cabs that gave me a wild idea – an idea that has now become a reality. One week ago I stumbled across the lime green tricycle taxi cab you see in the photo at the top of this post. There was a large paper sign on the front of the trike saying that it was for sale, so I asked the man how much he wanted for it, and he responded “300 Soles” (about $108 USD). I couldn’t believe the price! To make a long story short, I bought the tricycle from the man (for 250 Soles) and today I am leaving Puno, not on a bus like most tourists who visit this charming little city in Southern Peru, but on a single-speed tricycle taxi cab. The plan for the next 5-6 days is to ride this dilapidated old tricycle across the Peruvian Altiplano and through the mountains to the city of Cusco some 250+ miles away. My 100+ pound tricycle will be hauling approximately 50 pounds of gear, plus my own weight (155 pounds), and if I get lucky I’ll add on the weight of one or two additional passengers. To make this whole thing even more difficult, the elevation I’ll be traveling at is between 11,500 and 12,500 feet… I speak only a few words of Spanish, so conversing with the locals along the way will certainly be difficult… and more than anything else, I’m doing this completely on my own. This is not the type of bicycle touring I recommend for most people wishing to travel by bike, but after more than 10 years of long distance bicycle travel, I am certainly up for the challenge… and I’m ready to try something new. If I do indeed make it all the way to Cusco on my rusty old tricycle this may turn out to be one of the most incredible things I have ever done. Or, I may make it five miles out of Puno and realize that this is the most impossible mission I’ve ever created for myself. Either way, it’s going to be one hell of an adventure! So stay tuned! I’ll be out of touch for the next 5-6 days, but when I arrive in Cusco (whether that be on my tricycle or via a bus after abandoning the tricycle somewhere in the middle of Peru) I’ll be sure to tell you the whole story. Please keep your fingers crossed for me. The next few days are going to be tough. This entry was posted in Bicycle Touring Pro Articles, Main Articles, Peru, South America and tagged crazy adventures, crazy bicycle tour, crazy travels, difficult bicycle tour, hardest bicycle tour, peru adventurer, peru bicycle taxi, taxi bike, traveling across peru, tricycle taxi, wild adventures. Good Luck to you, A passenger pick up or two might provide a few extra céntimos. I put myself through Business school selling Novelty Ice Creams with a Worksman Tricycle Rig” ‘my daughter copied me years later with the same Trike. We at least have three gears and brakes but even with gears the hills are VERY tough with a full load (520 lbs.) – I can not even imagine what full fledged mountains would be like with a load…HAVE FUN!!! Here you go again, doing the extreme and hope you make it. Don’t give up and I know u won’t. All the best and wish I could be there to witness it. Cheers! this is awsome, i am sure you will ditch the trike though i have been on that road and its not single speed friendly especialy the high gear of those trikes. cant wait to see what happens. I would love to be back down there agian right now. I just finished reading a book where the author, a young tour-hardened bicycle traveler, rode a small trike with a seat on the front for the handicapped across England. She did it, but she was pushing a lot and making slowww time. Of course, you are a guy, but I can hardly picture that thing scaling a mountain, if needed. But never say never! Give yourself lots of time and expect rubber legs for the 1st week! Darren – I just got your email – yuou are joking right? About the equipmenty, I mean. Those superb photo’s reveal such simplicity and beauty, that your adventure was a HUGE success – the “equipment” was meaningless! Its about the adventure not the gear, right? Hey Bill. No, I’m not joking about equipment being important. I agree that you don’t need THE BEST equipment in the world to go on a long-distance bike tour. In fact, I see a lot of people let not having the right equipment prevent them from ever going on a bike tour… and I don’t think this is good. So sometimes I do think that you should try bike touring even if you don’t have the right gear. But in some cases, when the equipment is so bad, there’s just no way you can ever complete the bike trip… and that was certainly the case here with my Peruvian bicycle taxi bike tour. The thing was almost impossible to pedal and it prevented me from completeing the tour as I planned. And for others, sometimes using crappy equipment on a bike tour will produce the same results. And I don’t want that to happen. That’s why I saw that the equipment you use is important. 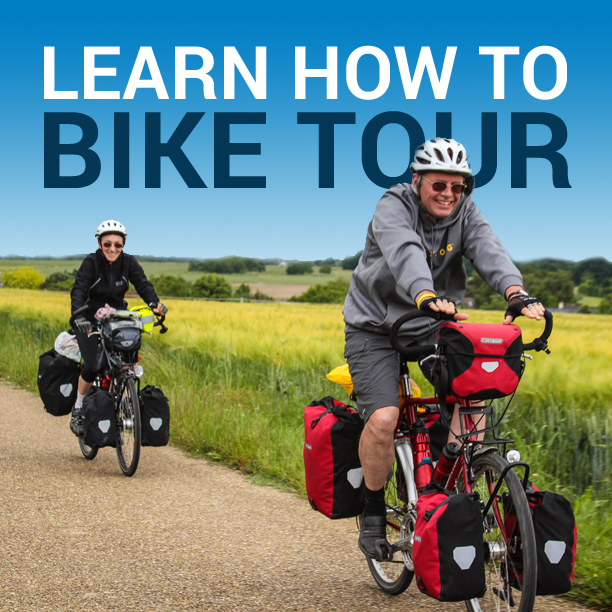 You can do a bike tour on sub-par gear, but it’s better and more enjoyable to have gear that works! That’s all I was trying to say. I hope that makes sense. Good Luck on your Tricycle tour !!! Oh dear! What a disappointing end to it all but i hope it was a good experience even it did not make the trip but i guess you have your ways of looking at things. It’s already a great achievement in my opinion that you took a tricycle and tired riding all the way to Cusco. You keep inspiring us folks here and I am a bit envious. Take care n safe journey. 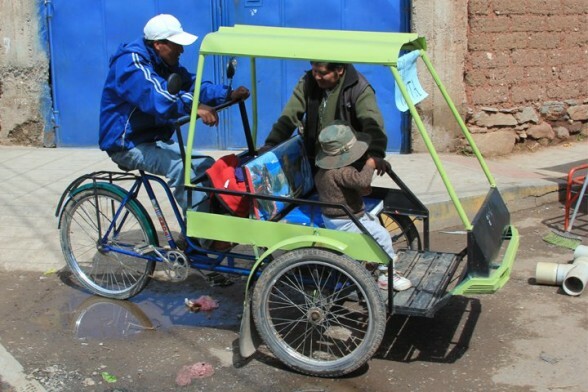 What I posted on FB: I was looking for a picture of a Peruvian Trike for another post and I ran across this foto. I’m nearly postive that straight behind the trike(Pioneros) back up that street, the brown building just this side of the red building on the right side of the street, is WHERE I LIVED IN PUNO, and where a member ripped off my electric razor and some of my comp’s cash. WOW! !